From pitch pipes to voice recorders, the list of standalone devices that an unadorned smartphone can substitute for runs long. But the portable electronics products that smartphones have had the most impact on have been digital cameras / camcorders, portable media players and portable navigation devices (PNDs, although the Europeans did a better naming job with "sat navs"). The future of PNDs looked rosier in the days when cellphone navigation services required a monthly fee. Google Navigation changed all that and much of the market was relegated to sub-$100, Black Friday-bought glove compartment hermits. But even as they've released smartphone navigation apps, companies such as Garmin and Magellan keep plugging away at the PND, trying to differentiate from the smartphone apps while cooperating with them. 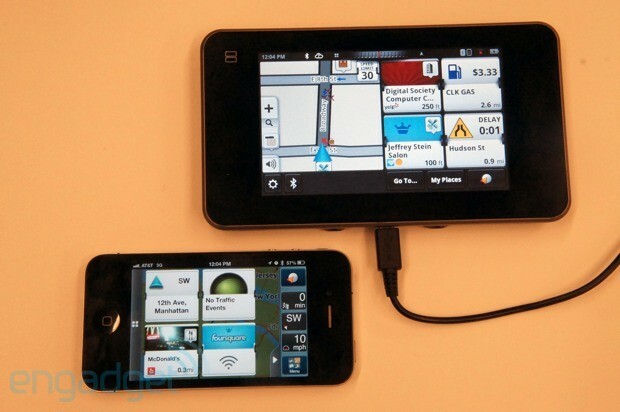 One example of this competition with the smartphone lies in the top two tiers of the Garmin nuvi line that include a feature called Real Directions, which Garmin collaborated on with Nokia. Providing a more human-like way of offering directions, the device will tell you to make a right turn "at the Mobil station" or some other real-world presence instead of just the number of miles or feet. Real Directions tends to kick in more on local streets than highways, where features like lane assist -- less common in smartphone apps -- come in handy. It also features voice commands that make many common tasks such as finding an address or going home simple, convenient and safer. The nuvi line has always stood for thin and light designs, and at least the Prestige model is featherweight enough to work well with a slick and fast-holding magnetic inductive mount that can be attached to either a 12-volt interface or a standard USB connector. The mount makes it easier to remove the device for text input and reattach it for navigation. At $100 less than the top-of-the-line Garmin, the chunky, large-bezeled slab embodying the Magellan SmartGPS doesn't strike as impressive a profile and its mount isn't as high-tech. Rather, the big picture of what Magellan's been up to is building its own cloud service called MiCloud that shares navigation data among the screens that you have been using. And in this particular unit, the main navigation display shares real estate by default with Live Tile-like Yelp and Foursquare info squares for places of potential interest that are updated as you get closer to them. It's helpful to have this information pushed to you rather than having to query it, but the whole system would greatly benefit from voice control instead of the soft "dial" control at the top of the Magellan user interface. In fact, being able to have it spoken back from a prompt would be even more ideal in place of sacrificing navigation screen real estate. Failing that, the dial should be a physical control; right now the only button on the device's face is a capacitive home button on the top-left corner of the display. As with the TV, where there are also distance-related usage constraints (although with very different contexts), the smartphone can make for a better research and input tool than a PND. As such, both the Magellan and Garmin units have companion smartphone apps that can send addresses to their PNDs via Bluetooth or, in the case of the Magellan, through the cloud. But the cost of focused effort in getting from Point A to Point B can be significant. The top-of-the-line Garmin sells for $349. At that price, it will do little to sway the average user of free and integrated navigation apps to adopt a dedicated device. For those who are willing to invest in them, though, high-end PNDs can offer a more connected and relevant navigation experience than ever before.